In the ongoing battle over the representation of the EMTA board, what has gotten lost in the shuffle is the service that the EMTA provides to the community. The main argument started by County Council is that the individuals that make up the board no longer best represent the community it serves, because many of them reside in the city – and the services the EMTA provides needs to expand beyond the city core. I am not arguing for or against this notion, as there are valid points to be made (and in full disclosure I am a member of the Authority); what is missing, though, throughout all this discussion is that even with the current makeup, the EMTA not only serves those outlying areas; it continues to foster relationships with townships to continue to expand these services as well. Currently, the organization operates a network of 32 fixed routes and downtown trolley shuttle routes. They also offer a complementary paratransit service, known as the LIFT – which the EMTA took over when the private operator went bankrupt. The basic adult fare for fixed routes is $1.25, and those age 65 and older ride free. I discussed these numbers and more with executive director Mike Tann and asked him to tell me in his own words what he believes the present and future of the EMTA should look like. He noted that while 70 percent of the EMTA ridership comes from the city area and the other 30 percent comes from the urbanized area, this is a typical public transportation model. "This is not going to change unless you systemically take away service from the city," he said, "but then you're no longer meeting that model – which we need to ensure." As for providing services in outlying areas? "We currently run more than 60 trips a day up to Robison Road in Summit Township, and this doesn't include the 22 trips daily to Presque Isle Downs. One of our routes extends as far out as Caughey Road and services The Porreco College 58 times a day; and 28 times a day another route goes to the Fortis Institute." Adding to that, EMTA buses "run to North East seven times a day, 21 times a day to Penn State Behrend, and 25 times a day out to Harborcreek." 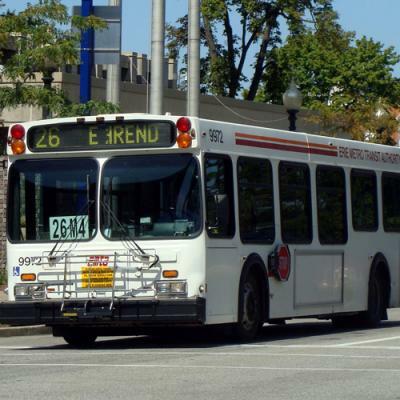 There are also hundreds of other daily trips into these areas via other routes, as well as daily service to Edinboro. "We also have a Welfare to Work transportation program running three shifts a day to Lake City," Tann added. But even with all this, the executive director notes that room for improvement of the EMTA exists. "We currently do not serve the needs of individuals living in Corry – and they are the second largest city in Erie County," he noted. "At one time, everyone lived in the city center and walked to school and work; I know this because I lived there. However, Corry has changed and much of the services have moved to outlying areas and therefore there is now a need for public mass transportation. The question then becomes how do we service it?" What many neglect to realize is that at the end of the day, the EMTA still needs to operate like a business. "We are running a labor-intensive, 300 employee business, and we charge a fare that is nowhere near the cost to operate," Tann says. "And if we go from Erie to Corry and don't pick up anybody in between, that's all miles – miles with no revenue." Additionally, 25 percent of the EMTA funding comes from the ridership. "We are going to be held accountable for the number of people that ride our buses. If the group puts services out there with no riders, they are then wasting taxpayer dollars – city, county and state." So while there is a need to service Corry, it needs to make business sense. Facilitation of the needs in other counties not only falls on the EMTA, County, and City, but falls partially on the local municipality as well. "These conversations continue to happen between the organization and the representatives of the municipalities - and while we continually need to grow and adapt, the way to get there is a well-educated, well-trained, and well-connected board." Lastly, and something to note in particular, a typical transportation model, such as ours, is designed to serve an urban population. And while Erie may not be on the same scale as New York, Chicago, or D.C., one of the intents of a mass transit system is to attract more citizens to live in the core of their city. So while we do need to continually increase services to outlying areas, shouldn't we be simultaneously finding ways to drive citizens back to the city – thereby helping to drive population in – not out.